Director David O. Russell has consistently made great movies in the last decade, like I Heart Huckabees and The Fighter. Last year’s Silver Linings Playbook was Russell’s best movie yet, setting the stage for his first masterpiece. American Hustle is not that movie, but it’s still remarkably good. Uniting cast members from Russell’s last two movies, American Hustle tells the tale of a con artist (Christian Bale), his wife (Jennifer Lawrence), his mistress (Amy Adams), and the FBI agent after him (Bradley Cooper). For good measure, Jeremy Renner is also thrown into the mix as a New Jersey mayor eager to do what it takes to revitalize Atlantic City. The plot of the movie spins itself out of the Abscam FBI sting operation that took place in the ‘70s, which led to the arrests of half a dozen corrupt politicians. When Agent Richie Di Maso (Cooper) busts hustlers Irving Rosenfeld (Bale) and Sydney Prosser (Adams), he negotiates a deal to let them go if they help the FBI take down some bigger fish. Soon, as tends to happen in movies like this, everybody’s conning everybody. From a technical standpoint, American Hustle is flawless. The costumes, make-up, soundtrack, and set design are all pitch-perfect to the period, giving the movie the feel of a film that doesn’t just take place in the 1970s but feels like it was actually filmed then. The movie has a time-warp effect, completely transporting you to the “Me” decade. The best con artist movies, however, from The Sting to Confidence, always keep the plot moving quickly. If the story slows down enough, audience members have time to start guessing how everything will end, which kneecaps the twists and double-crosses that often punctuate movies about tricksters. As long as the right hand keeps distracting someone, they won’t notice what the left hand is actually doing. 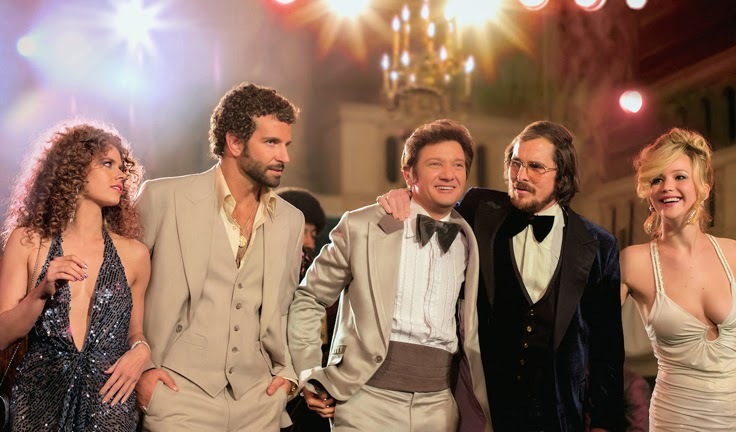 American Hustle, by making its characters as detailed and elaborate as the plot, ends up being its own worst enemy. During slower scenes of character development wherein the plot stands still, too much time is left for audiences to piece together the ending. Russell seems so used to taking the time to fully form his characters that he forgets to keep the audience distracted with plot. When the ending does come, it fails to leave the impact of a powerful climax. The movie seems to simply deliver its finale with a shrug and make a quick exit. So much of American Hustle is meticulously thorough, but if just some of that attention had been taken away from the characters and setting and shown instead to a more distracting plot, David O. Russell could have pulled off his greatest trick yet.